Is Climate Change to Blame for Hurricane Harvey and Other Extreme Weather Disasters? Over the course of just four days in late August, Hurricane Harvey drenched a massive swath of Southeast Texas, flooding much of Houston and the surrounding region with more than 50 inches of rain. One recent analysis identified the record rainfall as a 1-in-1,000-year flood, or the kind of extreme weather event that has a 0.1 percent chance of happening in any given year. In other words, unprecedented. Ideas for analysis, discussion and multimedia projects. Browse our lesson archive. But that may come as cold comfort to waterlogged Houstonians, who already experienced a pair of other major deluges in the last two years, both of which were labelled 500-year floods. And with forecasters now shifting their attention to Hurricane Irma -- one of the most powerful storm's on record that's already terrorized parts of the Caribbean en route to Puerto Rico and Florida -- these “unprecedented," once-in-a-lifetime disasters of biblical proportions are starting to seem a lot less extraordinary. Just consider the United States, where the rate of large, costly natural disasters has increased markedly over the last three decades, according to data compiled by the National Centers for Environmental Information. Explore this interactive map of billion-dollar weather events in the U.S. since 2000 . And worldwide, the number of natural disasters has quadrupled since 1970, United Nations Secretary-General Antonio Guterres recently told reporters. In 2016 alone, 24.2 million people were displaced by sudden natural disasters, he added, which is "three times as many as by conflict and violence." So what's going on here? Why are these so-called extreme weather events -- things like catastrophic flooding, heatwaves, droughts and even prolonged winter storms -- happening so much more frequently? As the latest Above the Noise video explains, there's an overwhelming body of scientific evidence that points to climate change as a major culprit. 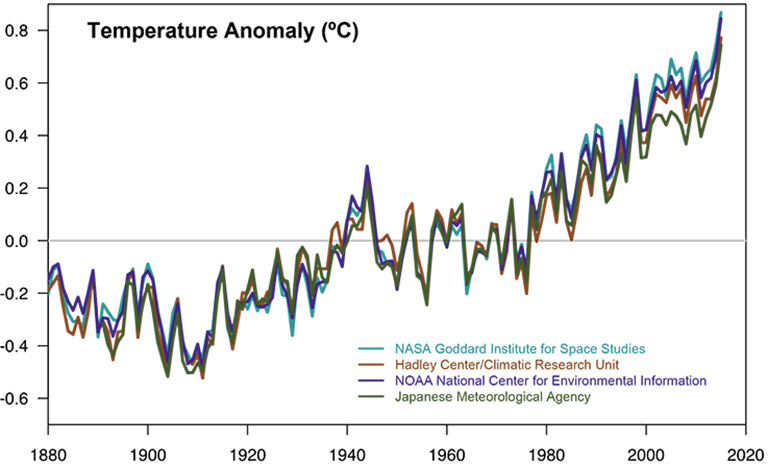 Global average temperatures have risen significantly in recent decades, in large part due to human activities, namely the burning of fossil fuels. In fact, the 10 hottest years ever recorded since global record-keeping began in the late 1800s, all occurred in the last two decades. 2016 went down as the hottest year on record, surpassing the 2015 record, and the one set before that in 2014. Climate scientists are generally quick to note that no single weather event can be solely blamed on climate change. After all, major hurricanes, droughts and other kinds of extreme weather are nothing new - they’ve been wreaking havoc for millennia. But the science clearly shows that a warming planet unquestionably contributes to more severe events. Scientists, Guterres noted, "are equally clear that such extreme weather is precisely what their models predict will be the new normal of a warming world." Take the increasing frequency of major tropical storms and floods, which scientists say are often exacerbated by warmer ocean surface temperatures and rising sea levels. Without climate change, a severe hurricane like Harvey may well still have been impressively destructive. But the ample vapor from warming surface waters in the Gulf of Mexico -- now as as much as seven degrees warmer than the long-term average -- contributed to the unbelievable volume of rain that the storm collected and then dumped on Texas. “The Atlantic was primed for an event like this,” Kevin Trenberth, a scientist at the National Center for Atmospheric Research, told the Guardian. In other words, climate change didn't necessarily cause Harvey, but evidence clearly shows that it made the storm more destructive. "Harvey, like every extreme weather event, occurs due to a pile up of random accidents in the atmosphere. Climate change can at most push the odds a little bit in one direction,” Adam Lobel, director of Columbia University's Initiative on Extreme Weather, said in an interview with The Takeaway radio show. When extreme weather events are directly linked to temperature, he said, it becomes easier to make connection to climate change. Regardless of evidence, climate change still remains a highly politicized issue in the U.S., often falling along partisan lines, with key members of the Trump administration and various other Republican leaders downplaying its significance, or in some cases, denying its existence altogether. Pruitt's sentiment, though, was echoed by a number of conservative policy organizations who were quick to question any link between major storms like Harvey and climate change. To this argument, Adam Lobel of Columbia counters that those who insist it’s not the right time to bring up climate change are the people who never want to talk about it, particularly conservative political leaders. He notes recent efforts by the Trump administration to rescind Obama-era climate change policies, including a withdrawal from the Paris climate accord and the rollback of regulations to limit greenhouse gas emissions from power plants. The following interactive map, produced by the British organization Carbon Brief (and embedded with permission), shows 144 extreme weather events around the world that scientists published studies about in peer-reviewed journals. 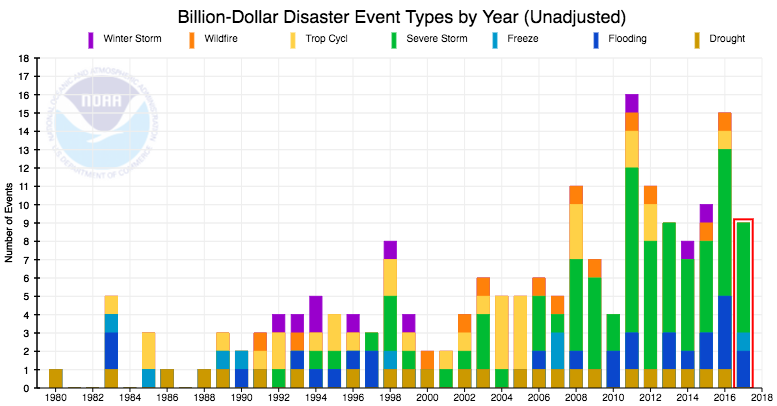 Nearly two-thirds of these events were made more likely or more severe by human-caused climate change, according to the authors of the studies. Heatwaves accounted for almost half of these events, followed by droughts (21%) and heavy rainfall or floods account (14%). Read the full analysis here.